Don't have a ticket to this years's Apple Worldwide Developers Conference? 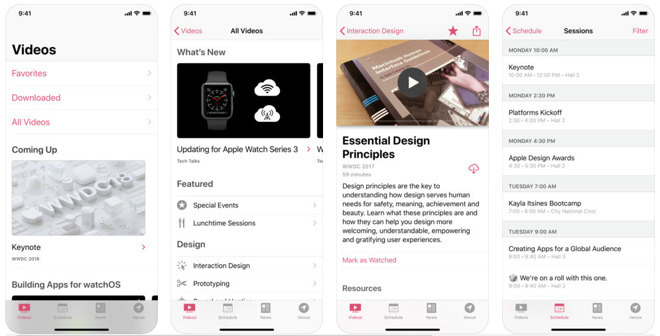 The company's new 2018 edition of the WWDC app for iPhones and iPads gives you a virtual seat to this year's conference, with a wealth of educational videos now organized at your fingertips. Videos are now "front and center," making them easier to find and watch, Apple said in its release notes. Since WWDC tickets are limited, this is often the only way for many developers to catch up. The app has been redesigned to make it easier to find favorites, sessions, and labs as well, including a new topic-based organization. When looking at some items, Apple will suggest related videos and events. Getting into the technical side of things, the update offers access to documentation and resources, including even sample code. Apple has separately announced a special Close Your Rings Challenge for Watch owners attending WWDC. Between June 3 and June 7, people will be able to join with three other attendees and work to close their Activity rings. Participation requires downloading the Challenges app, applying for an invitation code, and joining or creating a team. Apple notes that participants should also adjust the Move goal on their Watch to match their targets. The company hasn't said what the reward will be, except that it will be handed out on June 8 at the McEnery Convention Center where WWDC is being held. AppleInsider will be on the scene at WWDC 2018 to offer live coverage of the keynote and following events. Follow us on Twitter @appleinsider and Facebook for the latest WWDC news.